Eric Cantor’s extreme voters: The House Majority Leader’s 7th District primary voters were white, old, and conservative. Voters don’t get much whiter, older, or more conservative than the ones who just ousted Eric Cantor. Thad Cochran, left, and Eric Cantor. Photo illustration by Slate. Photos by Tom Williams/CQ Roll Call. Eric Cantor, the House majority leader, spent his career denouncing liberals, sucking up to the Tea Party, and doing everything possible to derail President Obama’s agenda. Despite this, Cantor was ousted Tuesday by a Republican challenger in Virginia’s 7th Congressional District. Cantor’s loss follows last week’s Mississippi Republican primary, in which Sen. Thad Cochran, another conservative, was edged out by a Tea Party opponent who’s expected to dispatch Cochran in a runoff. 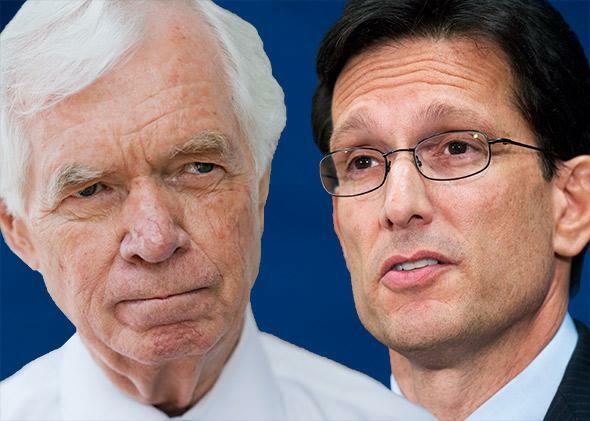 How do right-wingers like Cantor and Cochran lose to challengers even further on the right? The answer lies in the extremism of Republican primary voters. On June 2, Vox Populi Polling, hired by the Daily Caller, conducted a poll of “Active GOP Primary Voters” in Cantor’s district. Three days later, Chism Strategies, a firm that usually works for Democrats, polled Mississippians who had voted in Cochran’s primary. Both surveys were automated, and Chism has released its demographic data only in unweighted form, so the results should be taken with a grain of salt. Still, they’re the best available measures of who actually voted in these primaries. The Daily Caller poll, in particular, came closer than anyone else to predicting Cantor’s defeat, so it has the most reliable portrait of his electorate. What these two polls show is how white, old, and conservative the voters in these contests were, compared with the national electorate. Let’s start with race and ethnicity. Here’s how the Virginia and Mississippi GOP voters compare with the 2012 national presidential electorate, as reported in the national media exit poll. The national electorate is 13 percent black and 10 percent Latino. The Republican sample in Cantor’s district is 6 percent black and 1 percent Latino. The Mississippi Republican sample is 2 percent black, and everyone else is either white (96 percent) or “other” (2 percent). Next, look at the age difference. Seniors comprise only 16 percent of the national electorate, but they’re 43 percent of the GOP sample in Cantor’s district and 70 percent of the Mississippi GOP sample. The 70 percent figure is so high that I have to assume it’s distorted by oversampling. But if so, the distortion isn’t deliberate. These are the people who answered their phones and identified themselves as voters in the Republican primary. The Virginia sample looks more balanced, but check out the difference in youth. People under age 45 comprise nearly half of the national electorate, but only 17 percent of Cantor’s primary electorate. Now look at ideology. Conservatives make up only a third of the national electorate, but they’re 70 percent of the voters in Cantor’s primary. Moderates are the biggest group nationwide (41 percent), but in Cantor’s race, they amounted to just 26 percent. Here’s what voters said when they were asked to name their most important issues. The U.S. data here aren’t from exit polls, because I had to find surveys in which the responses were reported in categories similar to the Virginia poll. The 2012 U.S. data are from an ABC News/Washington Post poll taken in May 2012. The 2014 U.S. data are from a Kaiser Family Foundation poll taken in May 2014. In both national surveys, respondents were left to answer the question in their own words (the Kaiser poll allowed them to name more than one issue; the ABC/Post poll did not), whereas the Virginia poll asked respondents to choose from specific categories. But the differences are too big to dismiss as artifacts. Most respondents in the 2012 national poll volunteered jobs or the economy as their top issue. Only 22 percent of the voters in Cantor’s primary agreed with that priority, even though it was explicitly offered in the questionnaire. Thirty percent of the voters in Virginia’s 7th District named debt and spending, which didn’t even crack double digits in the national polls. And while fewer than 10 percent in the national polls said health care reform was their top issue (pro or con), 25 percent of the voters in Cantor’s district specifically said their top issue was “Stopping Obamacare.” As for immigration, the percentage of people who volunteered it as the most important issue in the 2012 U.S. survey was less than half a percent. In the national poll, most respondents said the focus should be on legalization of immigrants already here. Only a quarter of Cantor’s primary electorate shared that view. Sixty-four percent said the focus should be on halting illegal immigration. The Daily Caller poll also asked respondents whether we should “deport every immigrant who is in the U.S. illegally,” offer these immigrants a way to “gain legal status,” or “something in between.” A similar poll, commissioned last November by the Public Religion Research Institute, asked U.S. adults whether we should “identify and deport” these immigrants, offer them “a way to become citizens,” or “allow them to become permanent legal residents.” In the national poll, 63 percent called for a path to citizenship, 18 percent called for deportation, and 14 percent picked the middle option. In Cantor’s electorate, nearly twice as many respondents (33 percent) called for deportation. Only 23 percent endorsed a path to legalization. This is how guys like Cantor and Cochran get defeated. The people who vote in their primaries are wildly unrepresentative of the general population. The real mystery isn’t how these guys lose. It’s how the candidates selected by such extreme electorates end up running the country.